The Mercury 6hp FourStroke portable outboard motor isn’t the most powerful, but it’s the best overall in its class. 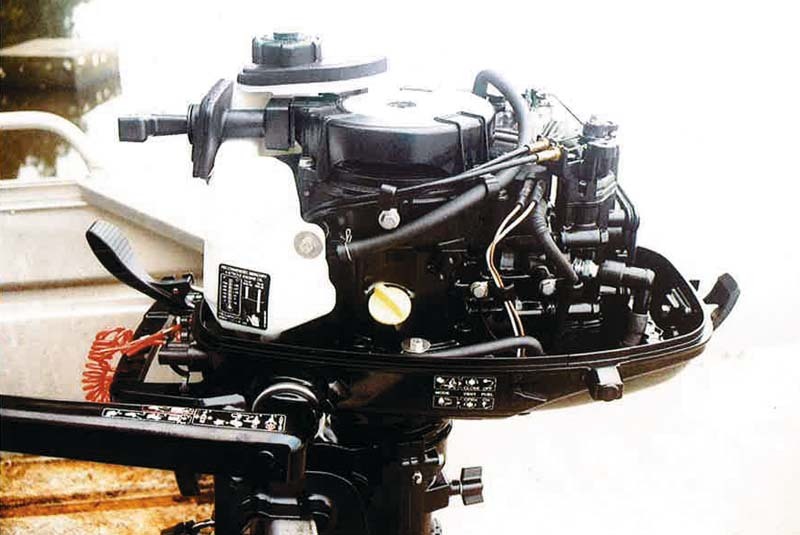 Single cylinder four-stroke 6hp portable outboard motors are unique in the recreational boating world. All two-stroke sixes have two cylinders and are normally de-rated from 8hp, but not the four-strokes which are up-rated from 5hp. So why would I bother testing a four-stroke 6hp instead of a 5hp? The reason is simple: all four-stroke 5hp outboards weigh 5 to 7kg more over two-stroke 5hp engines. Doesn’t seem like much but on a 3-3.5m tinny it’s enough to seriously affect planing performance — simply because of the additional weight aft of the transom. Tests I performed with two and four-stroke Mercury fives on a flat-bottomed 3m punt showed that pushing a total of 255kg, the 20kg two-stroke five cruised on the plane at 11.6kts and 5000rpm. But swinging the same 8in prop and load, all the 26.1kg four-stroke could manage was a semi-planing 8.9kts and 4500rpm. At WOT the two-stroke averaged an impressive 16.7kts and 6000rpm, while the four-stroke could just maintain a clean plane of 11.5kts and 5000rpm. Under identical test conditions a four-stroke Mercury 6 cruised at 11.5kts and 5000rpm, but ran out to 15.3kts and 5700rpm at WOT. On a bigger tinnie, such as my 2003 Sea Jay 3.4 Punt, the four-stroke six outperforms the two-stroke five because it has more midrange torque enabling it to plane heavier loads. Note the automatic tilt lock. 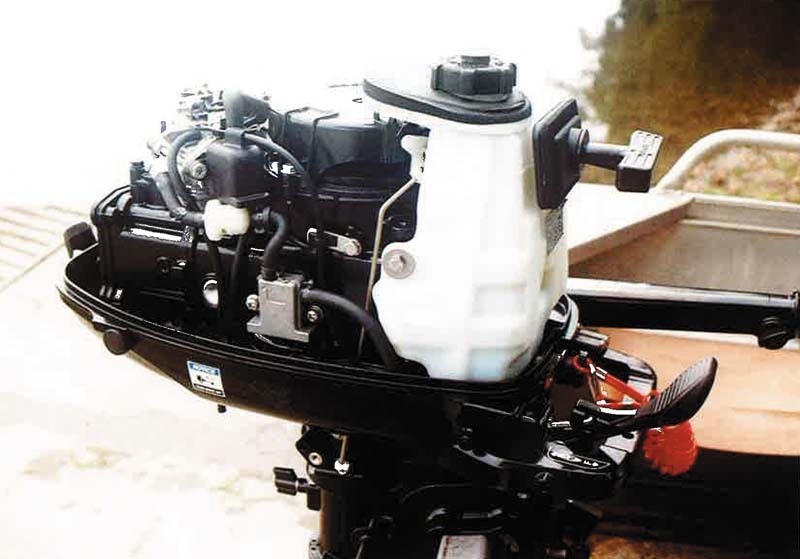 The Japanese-made Mercury 6hp FourStroke has a smaller displacement than its direct four-stroke outboard motor competition, but this translates to overall better fuel efficiency. The Mercury has gear-driven pushrod actuation of the rocker gear, a thermostatically controlled cooling system, electronic ignition timing advance and pressure lubrication. A low oil level light is behind the handle and a 12V 5amp alternator is optional. There are six trim positions with a single shallow-water drive setting and automatic full tilt and reverse locks. There’s also an upfront gear shift. Cleverly Mercury offers a 1.15lt integral fuel tank and a 12lt plastic tote tank as standard, yet these don’t affect powerhead access. Unfortunately the tote tank fuel line doesn’t detach from the tank making cleaning the tank filter screen a pain. Owners (and marine mechanics) will appreciate the large oil filler cap. The engine oil dipstick, spark plug and inline fuel filter are easily reached and removing the rocker cover to check valve clearances is easier than the Mercury 2.5 FourStroke I’ve been testing. The well-rounded upper cowl has effective water-trap air intakes that also vent engine heat on hot days. The 0.45lt engine sump is a bit small for a six to absorb oil dilution during extended trolling periods, so I’d change the oil every six months or 50 hours. A sump oil drain elbow under the engine pan makes changing the oil easy. I recommend using Quicksilver FCW SAE 10W30 oil for all temperate climates. The warranty coverage is "3+2" years. Swinging the standard 8in alloy prop, the loaner six was well-matched to the flat-bottomed Sea Jay 3.4 Punt which measures 3.4 by 1.42m and has six transverse frames, 1.6mm sheeting and all-welded construction. The perfect small skinny-water casting platform! Carefully run-in before my long-time co-tester Richard Ardizzone and I commenced performance, fuel efficiency and noise testing; overall the six was easier to operate than the competition. Its decompression arrangement made starting effort no greater than the 2.5 and oil smoke appeared only after the engine had been transported on its side. However having to leave the six in forward gear to set shallow-water drive or fully tilt it, is a pain and strange considering the two-stroke five can be tilted in neutral. Way easier than having to overcome prop thrust to tilt the six enough to engage shallow-water drive. Trolling is the forte of any four-stroke outboard and the six delivered incredible fuel efficiency. Not only were vibration levels low but across the entire rpm range it was quieter than the two-stroke five. Midrange vibration levels were reasonable for a four-stroke single but increased at WOT. Instant access to the fuel filter. Very handy. Mounted on a flat-bottomed punt up to 3.5m and pushing no more than a total of 300kg the Mercury 6hp FourStroke is the way to go compared to a two-stroke 5. Sure it costs more to buy and service, but the engineering and fuel efficiency are so good the extra investment is worth it. Mercury 5M and Mercury 6hp FourStroke on a Sea Jay 3.4 Punt, standard 8in pitch prop, two adults and fishing tackle totalling 285 and 290kg respectively, average of two-way runs on Lake Macquarie, NSW, calm water. See the full version of this review in Trade-A-Boat #474, on sale January 28, 2016. Why not subscribe today? 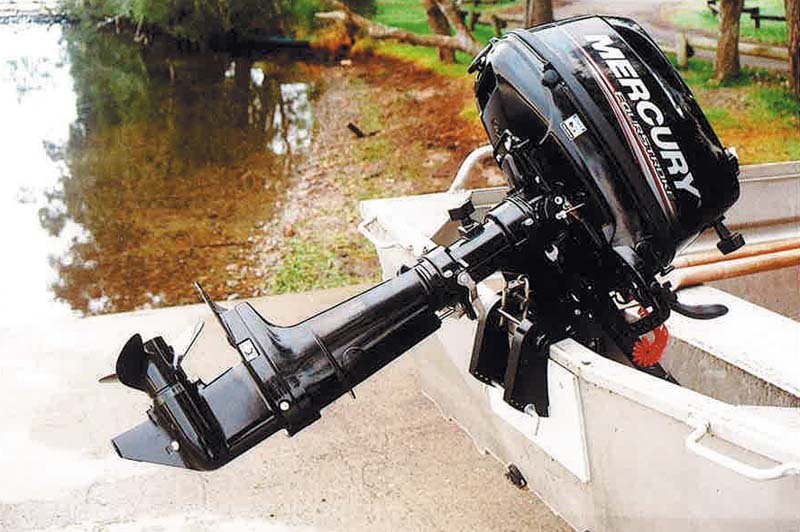 The portable 3.3 hp Mercury outboard motor is one gutsy little engine.